Fractures of the distal humerus usually involve the supracondylar portion of the humerus and are extraarticular. Less common fractures of this region include transcondylar, bicondylar, and intercondylar fractures which involve the articular surface of the elbow (and are termed intraarticular). Volkmann's ischemic contracture (due to decreased blood supply) of the hand is a known complication of the supracondylar fracture. The supracondylar fracture is generally due to hyperextension injury due to a fall on an outstretched hand. 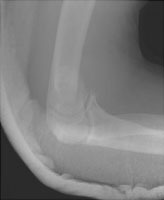 A Lateral radiograph of the elbow. B AP radiograph of the elbow. 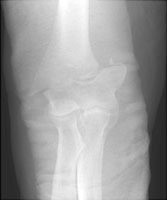 The patient has sustained an obliquely oriented supracondylar fracture and has been placed in a cast.